One thing that everyone has in common is that we all have a mother. Make your Mom a super special crafty gift from the heart this year. Use one of the following 25 ideas to inspire you. This free watercolor greeting card printable is perfect for Mother's day. Aniko owner of the website Place of My Taste has generously offered her beautiful artwork for download. The greeting card features delicate pink flowers that are beautiful and feminine. Also included is a matching envelope printable that can double as decorative floral wrapping paper. Moms will love this greeting card ensemble. The plant watering can with a vinyl decal is a perfect gift for Moms who love plants and gardening. The can is upcycled with gold paint and decorated with vinyl wording. This gift can be used as a garden tool and also as home decor. After you wrap your Mothes Day gift, add some crafty style to your packages with these cute chalkboard labels. They look especially lovely with brown kraft wrapping paper. Flowers from your garden or inexpensive bouquets from the grocery store can look like they came from a boutique florist when wrapped with beautiful paper. The flower bouquet printable features sweet Mother's Day sentiments that let your Mom know just how much you love her and how special she is to you. Don't forget to honor your grandmother on Mother's Day too. Print and frame this beautiful design. Such a simple gift but so huge on sentiment. Nana will love it and proudly display it in her home. Nine-year-old Chloe, blogger, and YouTuber extraordinaire designed this lovely Mother's day card. Chloe has autism and has found that vlogging helps build her confidence. Make sure to check out her videos to learn more about her world. This greeting card printable has hand drawn and colored elements as part of the design. A sweet card that any mom would adore. This card is terrific for those that want to give handmade items but don't have artistic skill. Kids will enjoy printing, cutting and decoupaging this cute bowl. It is relatively easy to make, and the end results look amazing. Give Mom some unusual flowers that will last a long, long time. This paper rosette project is simply lovely.The craft also doubles as a coupon book. Write your promises to your mom on the leaves of the flowers. 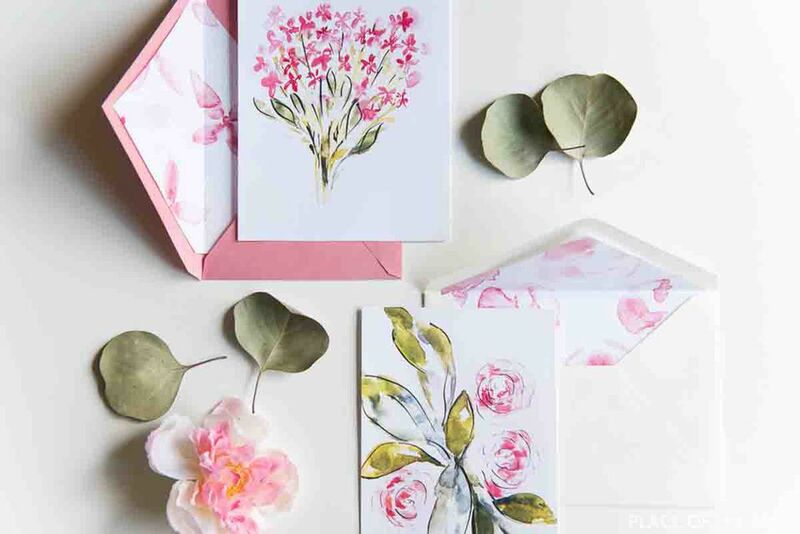 Paper promise flowers are a gift your mom will treasure. Give your mother this unique square flower wreath. It will add a burst of colour to her front door. So beautiful! One doesn't ordinarily associate paper with vases, but it is possible to make a paper vase.The secret is to place a glass cylinder inside the paper vessel to hold water. This origami container has a contemporary look that will fit today's lifestyles. Make your Mother's day brunch festive with these purple patterned napkin rings and placemats. A Kailo Chic offers a free printable download and tutorial. This craft is a gift that every mother will love and want to have. Transform you children's scribbles into amazing printed pieces of modern art. It is a piece of wall art that she will treasure forever. A plain block of lucite gives an attached photo a high-end look. Make one for your Mom featuring a picture of her children or her grandchildren. It is guaranteed to be a treasured gift. Washi taped bangles are something that kids can make as a gift for their Moms. The construction process isn't complicated, and the end results look amazingly professional. The coloring craze has gone one step further. Now you can have a plastic tumbler that is lined with a hand colored sheet. Kids could color a page and then give their mom a "one of a kind gift." What an excellent idea! This craft idea is a thrifty gift for Mom but one that she will love. Stamp a design onto ordinary river rock and finish with a sealer. Your mom can then line her garden with several stamped stones as decorations. Very pretty! Bibliophiles always can use an extra bookmark. Color-block bookmarks make excellent Mother's Day gifts for moms that love to read. Make a beautiful styrofoam butterfly egg for your Mom this Mother's Day. It is pretty to look at and works well as shelf decor. Mixed media art lovers will appreciate this project. Make a bird's nest that holds a decoupaged egg with a cutaway which contains a momma bird sitting on her eggs. Children can express their feelings and memories with these Mother's Day note printables. Parents will save these notes for years to come. This craft is a simple but unique gift that will be treasured. Find a photograph of a happy family moment and turn it into a greeting card for Mom. Put the card in a frame as a keepsake. All the family member will remember the happy time each time they look at the framed card. Kids can make a memory book as a gift for Mom on her special day. It is a sweet gift Moms will love and look at for years to come. Surprise your Mom on Mother's Day with this love bug cardholder and card. Make the bug base from oven bake polymer clay, and the spring from a paper clip. These cute little clay bugs look very professional. Does your mother like unusual art in her home? Make her a butterfly mobile. She will think of you fondly every time she looks at it.